I’ve gone from being on a pumpkin kick to a peppermint kick . . .it must be the holidays! These cookies are so yummy. I took my recipe for chocolate marshmallow cookies and just rolled the dough into smaller balls and then frosted them with insanely good candy cane buttercream, then I rolled the edges in crushed candy cane. I’ve mentioned it before, but to me, it’s all about the frosting—feel free to use a little less frosting, but why would you? 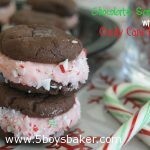 Make sure when you are crushing the candy canes for the frosting that you pulverize them in a blender or food processor. You want them to turn into powder. Also, if you want the mint flavor a little stronger, add the peppermint extract. I added about 1/4 of a teaspoon and it was just perfect. These cookies not only look so dang holiday-ish (is that even a word? ), they are absolutely delicious! If you’re needing a fun, yummy neighbor treat, these cookies would be perfect! Preheat oven to 350 degrees. Line a cookie sheet with tin foil or a silpat liner. In mixing bowl combine shortening, sugar, milk and vanilla. Mix well and add in the dry ingredients. Using your hands, roll dough into small balls (about the size of a quarter). Place onto lined cookie sheet. Pat down slightly with the palm of your hand. Bake for 8-9 minutes. Don't overbake! Allow cookies to cool and frost with candy cane butter cream. Roll edges in crushed candy cane, if desired. In medium size bowl, mix butter, powdered sugar and cream until smooth. Add more cream, if necessary to reach desired consistency. Mix in candy cane powder and peppermint extract (if using).